Climb up to these nearby mountain towns for a getaway with a Western flair. Be hungry. That’s the first rule of any visit to darling Bow Edison, a pair of tiny twin towns about a half-hour north of La Conner and a quick detour off farmland-scenic Chuckanut Drive. Bow is actually marked just by the turnoff to Edison; you’ll see the Rhododendron Cafe and the Bow Post Office at the Bow Hill Road intersection. Make your way into Edison. Your first stop should be at Farm to Market Bakery (Bow, 14003 Gilmore Ave.; 360.766.6240), where you can pick up a lime-soaked polenta cake or two for breakfast or a snack. But if you’re lucky enough to be visiting on a weekend, save room for the gorgeous farm-to-table lunches awaiting in the town of Edison at Tweets (Edison, 5800 Cains Court; 360.820.9912; open Friday–Sunday only). Chef David Blakesley creates ever-changing menus that showcase the area’s sensational produce. Or stop into Slough Food (Edison, 5766 Cains Court Suite B; 360.766.4458; sloughfood.com) to browse the serious selection of cheeses, Euro and WA wines (owner R. John DeGloria used to work at Pike and Western! ), and to get a bowl of homemade veggie soup and a quite supreme ham and Gruyere sandwich on toasted baguette. Browse through town and stop in at the Edison Eye Gallery (Bow, 5800 Cains Court; 360.766.6276) and the Lucky Dumpster (14044 MacTaggart Ave.; 360.766.4049), where recycled materials become gifts and reclaimed wood becomes gorgeous furniture. 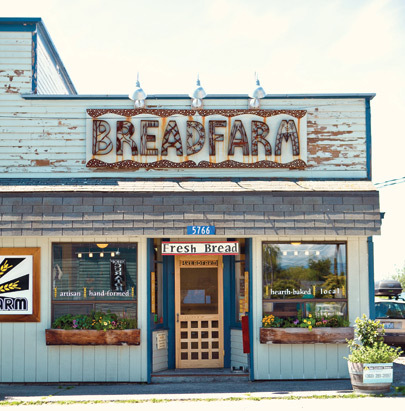 Next, pop over to the Breadfarm (Edison, 5766 Cains Court; 360.766.4065; pictured left, photo by Gabriel Rodriguez) to pick up a loaf of the sensational bread (black olive baguette, Tonasket rye or multigrain) and then head back toward Bow to the Samish Bay Cheese shop (Bow, 15115 Bow Hill Road; 360.766.6707), where splendid cheeses await (the Ladysmith and Port Edison are standouts). Bread and cheese in hand, it’s time for a scenic drive and an impromptu picnic on your way to The Wild Iris in La Conner. (There’s no in-town lodging in Bow Edison, though there are several house rentals in the area, some of them waterfront. Check vrbo.com for those listings.) It’s a pleasant trip, especially if you take Farm to Market Road or the longer (but worth it!) trek via Bayview Edison Road, which winds through farmland and offers sensational views of hidden inlets and wetlands. GETTING THERE: About 90 minutes north of Seattle via Interstate 5. See map. 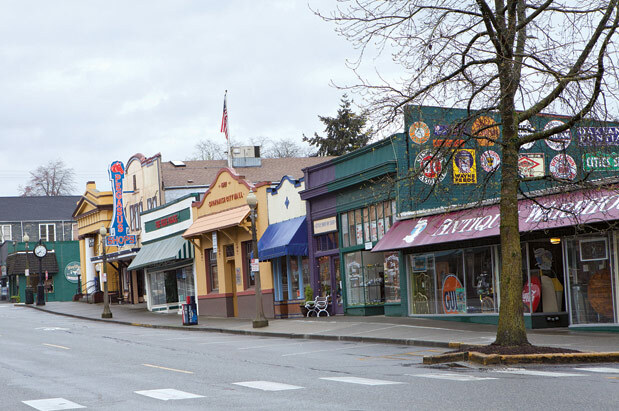 While Snohomish has not forgotten its roots as a working river town, these days it is better known as the antique capital of the Northwest. Indeed, the dizzying array of farmhouse-chic antique and home décor shops backed up against the still-working waterfront give Snohomish’s bustling First Street an Old Ballard Avenue feel. While the bad economy has taken a few landmark businesses down in Snohomish, those that have remained—Annie’s (1122 First St.; 360.568.4242), Joyworks (1002 First St.; 360.568.5050) and the Speckled Hen Country Store (922 First St.; 360.568.9758), to name a few—are more beloved than ever. Be sure to make time for Fred’s Rivertown Alehouse (1114 First St.; 360.568.5820), where the diverse comfort-food menu supports the establishment’s star attractions: 32 beers from Northwest microbreweries and from Europe on draught, and one of the largest selections of single malt Scotch in the nation. While Fred’s provides a nice “public house” vibe, real pub crawlers should make their way down the block to Piccadilly Circus (1104 First St.; 360.568.8212), an English restaurant serving up shepherd’s pie, ploughman’s lunch and toad-in-the-hole, among other authentic Brit delicacies. And don’t forget to stop into the Snohomish Bakery (920 First St.; 360.568.1682)—for olfactory reasons if no other, although chances are you won’t be able to resist a croissant or slice of cake. Overnighters can rule the roost at the Cadyville Carriage House (304 Avenue A; 360.568.5390), a quaint garden guesthouse behind the historic Matt Albert House. B&B lovers will appreciate the accommodations at Countryman Bed & Breakfast (119 Cedar Ave.; 800.700.9622), housed in an historic Snohomish home. GETTING THERE: From Seattle, about 45 minutes north via Interstate 5 and U.S. Highway 2 East. See map. Maybe it’s the sunny skies and drier air, but somehow Cle Elum feels more like the West than Seattle (despite the geographic facts). Given this favorable weather, outdoor activities rule in and around Cle Elum and the surrounding Wenatchee National Forest. Go horseback riding with Three Peaks Outfitters (Cle Elum, 1150 Masterson Road; 509.674.9661), or try your luck at fly-fishing with a guide from the Troutwater Fly Shop (Cle Elum, 113 E First St.; 509.674.2144). It used to be that only railroad workers could stay over at the Iron Horse Inn in South Cle Elum (South Cle Elum, 526 Marie Ave.; 800.228.9246), but these days anyone can pay for the privilege. Seven guestrooms and four caboose cars feature antique furniture and railroad memorabilia that evoke the essence of a bygone era. 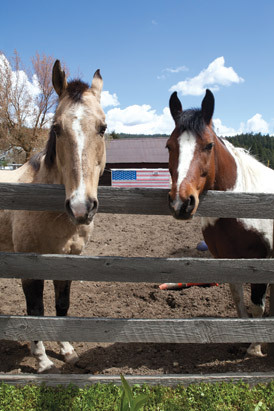 Meanwhile, horse folks might opt to bunk up in one of the cabins or canvas-walled platform tents at the Flying Horseshoe Ranch, which leads horseback riding tours (Cle Elum, 3190 Red Bridge Road; 509.674.2366). 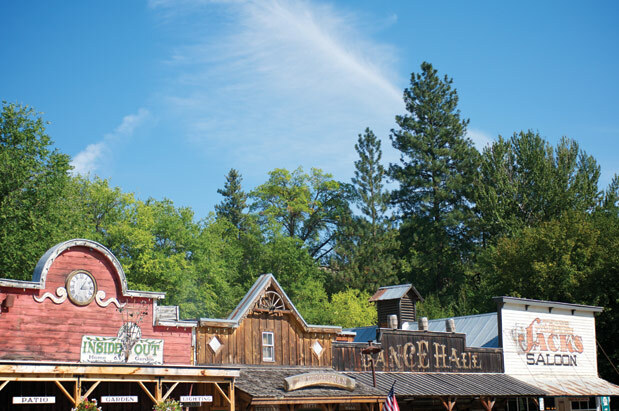 Whether on horseback, mountain bike or your own two feet, head northwest out of Cle Elum on the Coal Mines Trail and work your way past old mining relics for three and a half miles to the neighboring village of Roslyn. Originally built literally on top of the region’s most productive coal mine to service the miners and their extraction efforts, these days, Roslyn is still more famous as the stand-in for the fictitious town of Cicely, Alaska, in the 1990s television show Northern Exposure. While visitors must stop by the Roslyn Cafe (remember the camel mural from the show?) for a burger (Roslyn, 201 W Pennsylvania Ave.; 509.649.2763), history buffs shouldn’t miss the Roslyn Museum, which features displays on coal mining and local area history (Roslyn, 203 W Pennsylvania Ave.; 509.649.2355). Those who like their history mixed with a little fresh air can hoof it up the hills west of town to see the Roslyn Cemetery, where some 5,000 miners, most of them immigrants, were laid to rest in 26 different ethnic and lodge plots across more than 15 wooded acres. When the sun sets, head to The Brick Saloon (Roslyn, 100 W Pennsylvania Ave.; 509.649.2643)—founded in 1889, it’s Washington’s longest continually operating bar—for food, drink and live music, while the Huckleberry House B&B (Roslyn, 301 W Pennsylvania Ave.; 509.649.2900) is a great place to hang your Stetson (leave your Seattle Sombrero behind). —R.S. GETTING THERE: About 90 minutes east of Seattle on Interstate 90. See map. 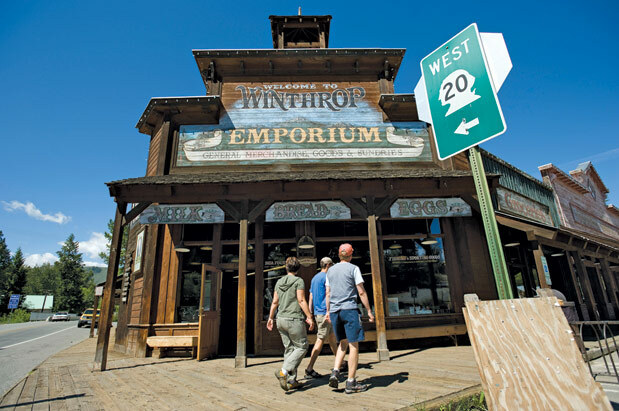 You’ve likely passed right through the teeny town of Twisp on your way to Winthrop, the Methow Valley’s famed Old West town and home to Sun Mountain Lodge. But just nine miles south, Twisp, which sits in the shadows of the North Cascades, surrounded by the Okanogan National Forest at the juncture of the Twisp and Methow rivers, is a destination for outdoor enthusiasts and culture seekers alike. Start with a sensational cup of joe from Blue Star Coffee Roasters (Twisp, 3 Twisp Airport Road; 509.997.2583), then pop into the Confluence Gallery and Art Center to view the latest local art (Twisp, 104 Glover St.; 509.997.2787; check the gallery’s website for readings and other events), or plan a visit to Merc Playhouse, which presents plays and music for children and adults (Twisp, 101 S Glover St.; 509.997.7529). Outdoorsy folks can team up with the fellows at North Cascades Fly Fishing for fishing-guide services on the river (Winthrop, 604 Patterson Lake Road; 800.572.0493, ext. 735), or Blue Sky Outfitters (800.228.7238) to go on a thrilling river-rafting ride. If adventurous eating is more your speed, Winthrop Tipi Dinners fits the bill: Three-course dinners for groups of as many as eight are served in a teepee decked out with lanterns and candles, and it serves dinner (by reservation only) year-round (Winthrop, Chewuch Road; 509.322.1751). No matter how you spend your day, a visit to the Twisp River Pub is a must, as there’s live music on weekends, great Methow Valley Brewing Company beers on tap (try the coffee stout, made with Blue Star coffee), tasty burgers with sweet potato fries, and a front-row view of the Twisp River (Twisp, 201 N Methow Valley Hwy. ; 888.220.3360). Stay in Twisp at the cozy Methow Valley Inn (234 E Second St.; 509.997.2253; rooms with private bath and breakfast, too, start at $119/night) or in Winthrop, splurge on a room with a glorious mountain view at the tony Sun Mountain Lodge (Winthrop, 604 Patterson Lake Road; 800.572.0493; rooms starting at $205). —A.A.S. GETTING THERE: About four and a half hours northeast of Seattle via Interstate 90 or S.R. 520 to Interstate 405 North, then onto U.S. Highway 2 East to U.S. Highway 97 North, to the Methow Valley Highway.